I used the day to work on a few things around the studio, send out my weekly newsletter and now it's time to run a few errands. But as we always say…"hope springs eternal..so in spite of the weather…I'm thinking spring. Here's a springy little card that we will be doing next week in Hostess Club. We have a new club forming and I would encourage you to think about participating. 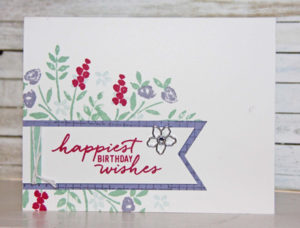 If you are a serious stamper or even a casual stamper, this is a great way to purchase a few items on a monthly budget, get together with like-minded stampers, make some adorable cards and learn new techniques. Club commitment is pretty easy. We meet for 8 months here in my studio and members agree to place a $20 order each month. Hostess rewards will be rotated among the club members. Winners all around!